From the bestselling author of "The Unlikely Pilgrimage of Harold Fry" comes an exquisite love story about Queenie Hennessy, the remarkable friend who inspired Harold's cross-country journey. A runaway international bestseller, "The Unlikely Pilgrimage of Harold Fry" followed its unassuming hero on an incredible journey as he traveled the length of England on foot -- a journey spurred by a simple letter from his old friend Queenie Hennessy, writing from a hospice to say goodbye. Harold believed that as long as he kept walking, Queenie would live. What he didn't know was that his decision to walk had caused her both alarm and fear. How could she wait? What would she say? Forced to confront the past, Queenie realizes she must write again. In this poignant parallel story to Harold's saga, acclaimed author Rachel Joyce brings Queenie Hennessy's voice into sharp focus. Setting pen to paper, Queenie makes a journey of her own, a journey that is even bigger than Harold's; one word after another, she promises to confess long-buried truths -- about her modest childhood, her studies at Oxford, the heartbreak that brought her to Kingsbridge and to loving Harold, her friendship with his son, the solace she has found in a garden by the sea. And, finally, the devastating secret she has kept from Harold for all these years. 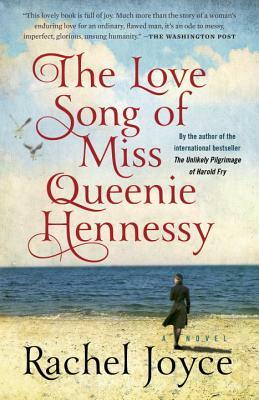 A wise, tender, layered novel that gathers tremendous emotional force, "The Love Song of Miss Queenie Hennessy" underscores the resilience of the human spirit, beautifully illuminating the small yet pivotal moments that can change a person's life. The Lovesong of Miss Queenie Hennessy is the third novel by actress, radio playwright and author, Rachel Joyce, and is a companion volume to her first novel, The Unlikely Pilgrimage of Harold Fry. Queenie Hennessy is dying. When she hears that Harold Fry is walking from Devon to Berwick-upon-Tweed to save her, that all she has to do is wait, she is transported back twenty years to Kingsbridge, to the brewery, to her relationship with Harold Fry. Her guilt about the events of that time has haunted her ever since, but a volunteer nun at St Bernadine’s Hospice convinces her to write to Harold Fry, to confess the truth, finally, before she dies. As Queenie fills her notebook, the events that led to her departure from Kingsbridge are revealed: some things, readers of Harold Fry will have suspected; others, they will have wondered about; and some will come as a complete surprise. Interspersed with her confessions are descriptions of Queenie’s Sea Garden and bits of everyday life in a hospice, some of which are hilarious (nutritional protein shakes that taste like wet cardboard, diversional therapy ideas, knitted syringe-driver covers), others, like the inevitable deaths, sad. Joyce gives the reader a cast of quirky characters: naïve nuns (and some very wise ones); a cranky Scot; a foul-mouthed woman who loves hats and entering competitions; a one-armed man constantly in receipt of parcels and an inexperienced counselor. She gives Queenie many words of wisdom: “We write ourselves certain parts and then keep playing them as if we have no choice”; “I found out what was right only by getting it wrong”; “Sometimes people judge their happiness by the price they have to pay for it. The more they’ve spent, the happier they think they will be” and “…sometimes you cannot clear the past completely. You must live alongside your sorrow” are a few examples. Joyce has, of course, ensured that the events of this novel dovetail perfectly with Harold Fry, and while Queenie Hennessy can be read independently of the earlier book, readers will find that the experience is much enhanced by reading Harold Fry first. Once again, the illustrations by Andrew Davidson are truly charming. Fans of Harold Fry will not be disappointed: if anything, Queenie Hennessy surpasses that book with its characters and also some lovely descriptive prose: “I have noticed the rain clouds drawing over the earth like a slate tablecloth and the wind beating at the black sea and tossing the gulls up and down like twists of white paper” and “The small leaves on the tree outside my window have stretched into green hands”. A delightful read.